I just finished grad school and finally have time to get back to my Prusa i2 build. I have everything built and wired up and have been able to successfully print a 40mm test cube after calibration! I am now having some fine tuning issues I'm hoping to get help with. 1. When starting a print, the bed heats up and then all the axis home in this order x --> y --> z. The x and y axis home perfectly, hitting the endstop and retracting slightly. The z-axis hits the endstop and retracts more, I'm guessing because the hotend needs to heat up next. After the hotend heats up the z-axis moves back down but not enough completely throwing off the paper thin leveling I did prior to the build. My solution right now is to manually spin the z-axis threaded rod while it is printing the skirt until it is close to where it needs to be which doesn't always work out the right way. 2. The y-axis tends to get stuck slightly in the same spot. I double checked that the bed moves smoothly without the belt on, added a tensioner to the y-axis belt and adjusted the voltage on the driver. At one point I was able to print a 40mm test cube with no sticking, all sides were perfect, and thought I somehow fixed it but when I went to print a fan mount afterward I got a horrible print and noticed the sticking was back. The default acceleration is at 3000 and I read to lower it to 1000 or 1500. Could this be a solution? Maybe there is another solution to try? I'll try to attach some pictures when I get home and maybe a youtube video of the movement issues. By the way I'm using the newest version of Slic3r if that helps at all. It sounds to me like you have a Z offset programed into Slic3r or that your accelerations are so high that the motors are skipping steps. You need to get the steps / mm, the speeds, the accelerations, and the jerk numbers into Marlin before you start trying to print. OK I came home after printing some upgrade parts at work, adjusted the acceleration and installed the new pieces. I installed a y-axis tensioner that is screwed right into the mdf. I got the y-axis belt nice and tight and tried a test and, at first it seemed to be doing OK then the skipping happened again. I decided to fiddle with the tensioner while it was printing and found that I may have had the belt too tight. Not sure exactly why a too tight belt caused this issue but it seems to be OK on the y-axis now. I'm still looking in to the z-axis. I'm going to double check the the calibration numbers. I checked if I had an offset by accident in Slic3r and it says zero. I know the endstop is in a good spot because if I just set home command it homes perfectly. It seems to only do that lift when printing. I found that slic3r has a default GCode that lifts the head 5mm (G1 Z5 F5000 ; lift nozzle). It just seems to not want to go back down 5mm its more like 3 or 4. Very odd if you ask me. I re-sliced the 40mm cube with some settings changed in Slic3r and the z-comes down a bit more but it is still off 1 or 2 mm to the bed. Is there any way to set the extrusion flow when doing a skirt? It seems that there is not much being extruded and the real flow doesn't start until about half way through the first perimeter on the actual object. I'd rather the skirt be terrible looking because too much is being extruded and have a good flow for the part over nothing coming out. hmmmm. Here is the starting GCode from the cube I just sliced. This may help. You appear to be aiming for a 0.2 mm thick layer with a 0.4 mm head and an extrusion width of 0.67 mm. That's a lot of width and not much height. A width to thickness ratio in the 1.2 to 1.6:1 range is a good start. Get things printing and then start trying to tweak stuff for super duper layers. A width that's 10 or 20% bigger than your nozzle isn't a bad place to start either. I don't see anywhere I can change that in slic3r. Do I change the width in the firmware? Your layer heights, and layer widths are changed in Slic3r. The firmware has no control on them. 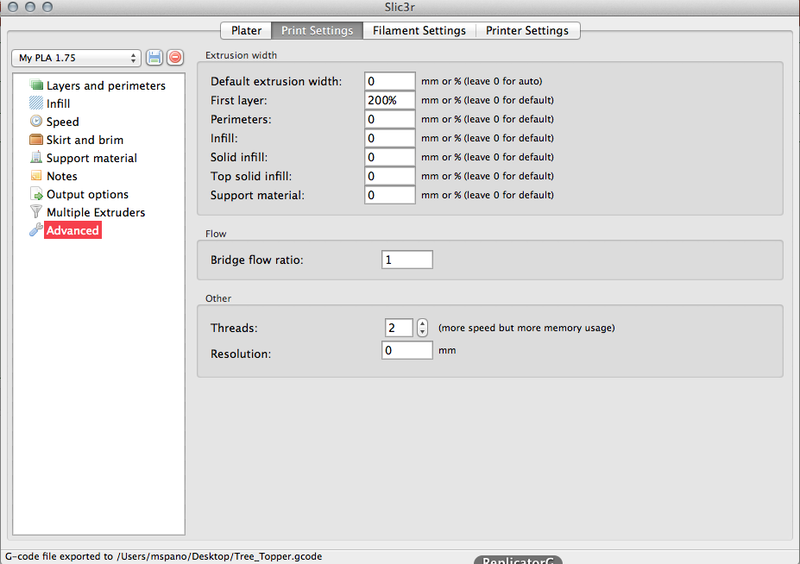 Setting up the layers and extrusion rated is a lot of what you do calibrating Slic3r to work with your printer. At least on my copy, you go to Printer Settings, then to Extruder 1, then to the top of the screen for nozzle diameter - that's not the hot end dimension, that's what the track width will be. Print Settings, right at the top of Layers and Perimeters gives you layer height. Extrusion multipliers show up under Filament Settings, Filament. Ok I see. I was under the assumption the nozzle diameter was the nozzle hole size. So going by your starting calculations if I have a .4 mm nozzle and todo 20% bigger to start, I should set the nozzle diameter to .48 and tweak from there? Extrusion rate is how fast the filament comes out? It's set at 1 right now. Extrusion rate multiplier is a fudge factor on the extrusion. Ideally it should always be 1. I would also take the "first layer" setting to 0 (default) rather than 200% in that screen shot. On a properly setup printer running a smooth bed, there's no need for anything other than a normal extrusion rate on the first layer. Well tonight I decided to not try and go for the big bang and went with a 3mm layer hight as well as some changes to the speed and such as discussed earlier. I am getting much better results now. Not 100% yet but getting there. 4. Go to print, everything heats up, all axis home but Z homes and then raises 5ish mm to head hot end. 6. I have to eyeball the z-axis height if I want to save the print. 7. Sidenote: I think the z-axis not moving before was a result of me manually setting the z-axis height and putting it too close to the glass. It is very deceiving with the glass as to how close the nozzle actually is. ** I'll post some pictures when I'm done rolling through the calibration .STLs I found. Hmm I know I don't have an offset in Slic3r set up. I'm going to double check the other things and report back. Other than the Z issue I'm starting to get really good results, even the hollow cube, bridge test came out OK. Thanks! G1 Z5 F5000 ; lift nozzle? Why is that command in there? Once the axes' are homed, the print starts by raising the Z axis by the layer height you have chosen - that's all it should do. It is not a z offset problem, because the offset would present itself in the gcode. Most likely, as stated, your motors are slipping. It is possible that the printer is driving Z down too fast when the print starts, so try to remove the lift nozzle command manually, and see if it works better. If the print is ok, then adjust your Z max speed and acceleration, or remove the lift command altogether. It can be found in Slic3r config. Your firmware should have reasonable limits for the max feed rate, jerk and accelerations for all your motors. Much better to set it there than in your slicing program. The firmware deals with things like jerk as well, which the slicer does not know much about at all. In the case of Z, a max feed of 2 , a max jerk of 0.2 and a max acceleration of 5 are pretty good settings to start with. The lift nozzle code is in there by default in Slic3r. Supposedly so it can heat the hotend away from the bed. It does move back down (that can be seen in the Z location on my LCD) it just doesn't move enough. I'm looking into the calibration numbers and all that later on tonight. I'll repost my findings. The lift and come back down thing is not the issue. That's normal Slic3r stuff. It always does that at the start of a print. It *should* come back to the surface of the bed. You might also check your Z drives to see if they are slipping (same for the nuts). I am also having that same problem with my ord bot Hadron. it uses threaded rods on the Z so I know there is no slipping. Im also using the latest slic3r version. I'll check the gcode as well to see if it is commanding the z to come back down far enough at the perimeter printing. The standard Slic3r code moves the head up and down correctly at the start of the print. There's not a bug there. The only issue with Slic3r is whether you have deliberately put a Z offset into the configuration or not. Almost all of the common non Delta printers use threaded rod to drive the Z axis. If there is slip it's in the attach between the motor and the thread rod. Unless you have a motor with thread rod welded to it, there's always the possibility of a loose nut / bolt / clamp / tube (what ever is used) at that point. OK I may have found why there is an issue with the Z being too far away. I think it has to do with the homing. When it homes it comes down hits the endstop and bounces back up about 1mm. This leaves the nozzle farther away from the bed than when I leveled it. The LCD screen says Z is at 0.00 so it thinks it is where it is supposed to be. This gap because it "bounces" off the endstop when homing is the cause of my gap. I read online that it is supposed to hit the endstop, bounce up a little and then slowly come back down until it hits the endstop again. Is there something I should add or look for in the code in Marlin to get it to do this? The X and Y axis do the bounce and then back. I think it is called an endstop recheck or something. In Marlin under Configuration_ADV.h there is code for the amount the axis moves away from the endstop before it rechecks. The x and y are set at 5mm and the Z is set at 1mm by default. It looks like the Z axis moving 1mm wasn't enough to deactivate the endstop and it thought it was homed even though it moved up 1mm. I changed this value to 3mm. Now it moves down, hits the endstop, moves up and then back down for the second check. I'll report back once I do a couple test prints. Oh My! That fixed it! I was just able to do a 1mm layer hight print no problem and no on the fly adjusting by me. AWESOME! I'll post pics when I get the chance. Happy Holidays Everyone! Prints are going pretty good now. New Question.Anyone know how to connect a fan so that it can be controlled? I have the Fan splitter from Gadgets3D that supposedly provides two PWM connections but I can't figure out where the PWM input is on the Ramps 1.4. Any ideas? See my post above. Check your firmware for the Z-Axis recheck bounce distance. The endstop may just be a little long and requires a little more bounce. Threads tend to get pretty crazy when multiple issues are involved. It's better to start a new thread for a new issue, or even for a new instance of the same issue. That way it's much easier to figure out who things are in reply to. I am just trying to get my printer started and I noticed mine does not do the bounce and recheck of home. I looked in the Configuration_ADV.h and the code is there and is not commented out. Is there somewhere else this has to be activated and is this necessary? It really helps, Because I think I may having same issue.